The crest known as: Ziringen Wonde, was worn by dancers during ceremonies marking the end of the periods of initiation of girls, and at funeral wakes. It symbolizes a young bride and the form of a front panel supported by two pillars and a long ringed neck, supporting a small head. 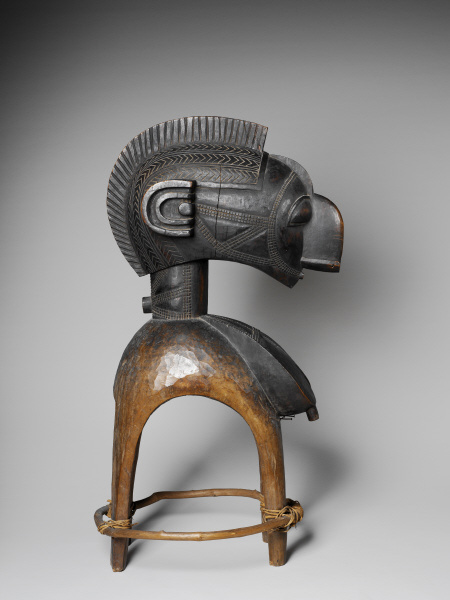 As in the case of Nimba mask, breasts, exaggerated in size are present and represents an allegory of fertility and birth. There are other that Baga headdresses in the form of a serpent, he is a guardian spirit and can measure up to 260 meters. They have a characteristic wavy shape, polychrome decoration, often in the eyes which are glass plates inserted. During the ceremonies in which the clans of each participating district are worn by dancers vertically using a support eb light wood. Other small crests representing the same spirit, were worn during ceremonies celebrating the end of the initiation of adults during the holidays or to accompany the beginning of the harvest period. These crests have a conical base supporting a long neck under a horizontal head pointed chin. The headdresses representing chimpanzees and birds symbolize the qualities inherent in these animals. The Baga are still using a Crest Banda said, this size has a significant mix of anthropomorphic and zoomorphic detail, it has the shape of a human face with elongated jaws of a crocodile, the horns of an antelope, the body of a snake and a chameleon's tail, it measures between 120 and 200 cm and now worn during the festivities and not religious. Traditionally it appeared apotropaic ceremonies, and at the end of the period of initiation of men. The crest Tonkongba called, is often mistakenly attributed to Landouman, neighboring people of Baga. He finds himself in effect throughout the region north of the territory administered by the Baga. It can be placed before the altar of each clan, or appear during the ceremonies, including sacrifices, such as funerals. The wearer of the Crest Tonkongba holds a power of divination, he has the opportunity to know and proclaim the good news and bad news in the west crest is described as representing a stylized dolphin heads, triangular snout, a globular head surmounted by two pairs of horns, is supposed to symbolize the tail of the dolphin. An unusual type of masks is probably related to feminine society Menda, it looks like a head with a long face, pointed chin, high forehead and rounded. So far two types of statues were identified. The first is the serpent mind, and is found mainly in the northern territory of Baga, this type of statue is placed on the altar of each clan, guarded by the oldest man of the family. It has a circular base, supporting a large head on the chin, resembling a bird's beak, it is relatively similar to the crest namesake, but its styling is more exaggerated.